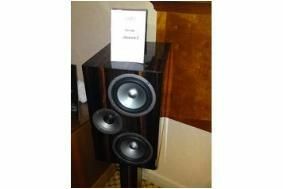 BRISTOL SHOW 2010: Meet the new Reference series from Acoustic Energy | What Hi-Fi? Due on sale in about two months, there will be two models: the £1500 Reference 1 and £2000 Reference 2 shown here. Both are standmount designs, finished in lacquered ebony veneer. The composite layer cabinet, made from an inert rubber layer/MDF sandwich, is said to be less resonant than one made from conventional MDF. The mid/bass driver has a long-throw, oversized magnet assembly for lower distortion and greater power handling. And the DXT lens matches the tweeter dispersion to that of the mid/bass driver to give a more natural sound, says Acoustic Energy. Impedance is 6ohms for both models, while sensitivity is 86.5db/W/m (Reference 1) and 89.5dB/W/m (Reference 2). Cabinet dimensions (HxWxD) are 31.5x19x28cm for the Reference 1, and 39.5x24x31.5cm for the much larger Reference 2. The optional stands with matching wood veneer finish cost £250.